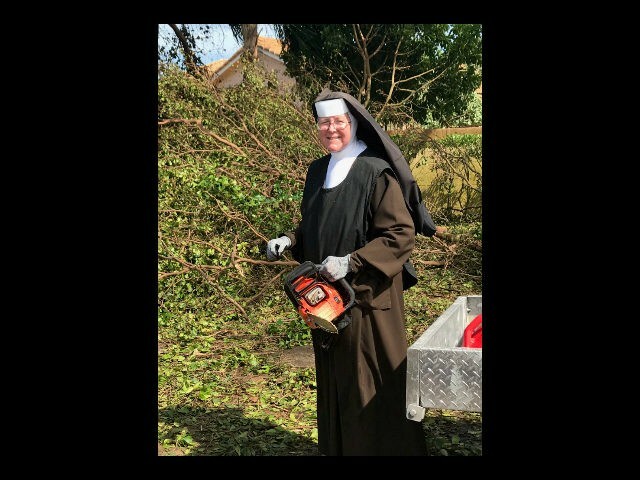 A nun dressed in a full habit was spotted using a chainsaw to clear brush from the fallen debris following Hurricane Irma’s destruction in Miami, Florida, according to a video captured by an off-duty police officer. An off-duty officer with the Miami-Dade Police Department spotted Sister Margaret Ann at work on Tuesday chipping away at trees and posted it on Facebook. The Miami-Dade Police Department shared the video, which has gained nearly one million views since its posting Tuesday. Sister Margaret Ann is principal of Archbishop Coleman F. Carroll High School, a Catholic high school located southwest of Miami’s downtown area. Sister Margaret Ann told CNN she felt called to action after seeing someone spin out near a blocked roadway. Many people who posted on the Miami-Dade Police Facebook page thanked the nun for her service and discussed how difficult it is to use a chainsaw while dressed in a full habit.